A wise man once said its all about taking responsibility in a situtaion not taking charge of it and this feels nowhere more relevant than working with young people. The biggest unknown when working in the outdoors is how individuals within a group will react to a given situation. You might think that all the angles have been covered and then someone in your care does something completely unexpected. In today's working environment so much of what we do is dictated by risk assessments, upholding our duty of care and how a group is managed at any particular time. It is important to recognise the legal implications of our responsibilities. Most inexperienced participants in the outdoors can sometimes act irrationally and young people cannot, in the eyes of the law, be expected to act reasonably at all. This means that even if a leader could trust the group to act in a certain way and they do something else that results in harm it is usually considered that the leader is at fault and not the young person. 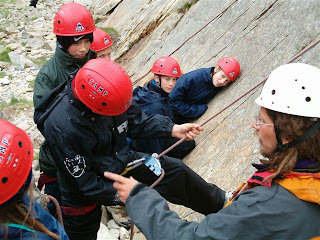 As outdoor practitioners, we do what we do because we believe its of some worth to those taking part. We encourage participants to take some risks. Perhaps helping them understand the difference between that and being reckless. In all of it everyone needs to be embrace their responsibilities. Be prepared to stand by their decisions and actions, whether it all goes according to plan or not.